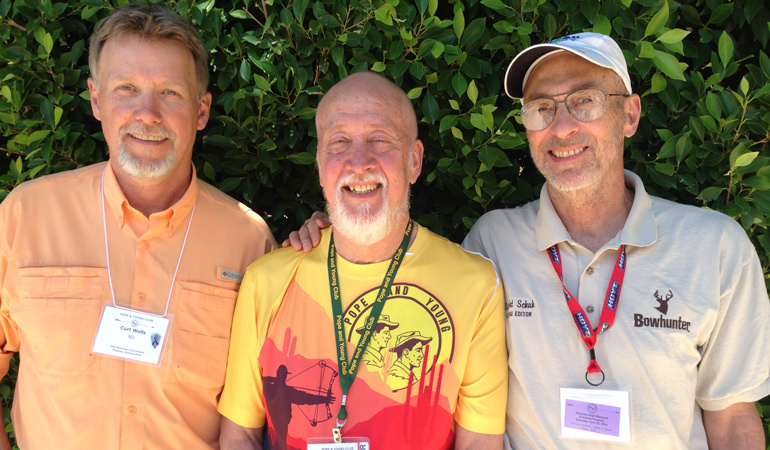 There have only been three editors of Bowhunter Magazine in its 48-year history — Curt Wells (left), M.R. James (center) and Dwight Schuh (right). It is with very heavy hearts that the entire Bowhunter staff must acknowledge the passing of our longtime editor, Dwight Schuh, after a long battle with multiple myeloma — the result of exposure to Agent Orange while serving his country in Vietnam. His was a long, valiant fight that only a man as tough as Dwight could sustain. He lost that battle at 2:45 p.m. Feb. 5. He was 73. When Bowhunter Founder M.R. James retired, he singled out Dwight Schuh as his replacement and Dwight served as Editor for 16 years until he retired in 2009. It was only a few months later when Dwight was diagnosed, and he has been fighting cancer ever since. Dwight was loved by all who worked with him. Publisher Jeff Waring worked with Dwight for 30 years and the man left an indelible mark on him. Current Bowhunter Editor, Curt Wells, is grateful for Dwight Schuh’s influence on his life. Also, watch for details on how you can share in the celebration of the life of Dwight Schuh and pay your respects. Dwight will never be forgotten.